Letterbox represent everything I stand for as a parent when it comes to toys for my girls. Traditional toys, a focus on learning but with fun at the heart. Simples. 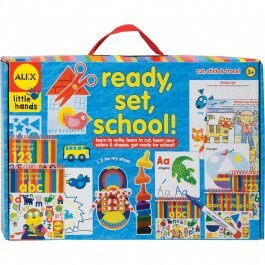 Letterbox sent Lara this fabulous Ready Set School! set to get her in the mood for her start at school this September. It is an enormous box packed choc-full of preschool fun and Lara can't get enough of it. When I first read that the Ready Set School cost £30 I was a bit surprised but when it arrived and I saw quite how many different exercises and activities there are for preschool learners I was VERY impressed. The set features (among other things) a board to help your child learn to tie their own shoelaces, stackable crayons, a huuuuge pile of printed activity sheets, sticker exercises and about 5 different wipe-off notebooks, each with a different learning theme. Lara loves the challenge of the shoe laces (it is way beyond her right now, but she'll get there) and is always a fiend when it comes to stickers. I've been so surprised at how long her attention is held doing activities that to me are so obviously "learning" as opposed to "play" and it makes me realise how ready she is to start school. Lara has most enjoyed the dot-to-dot puzzles because she feels proud that she can now follow the numbers around the page. I still need to help Lara read the instructions on most of the printed activity sheets, but once I've set her in the right direction she will spend a lot of time and effort getting it right. I recently loved watching her think really hard about what moods to allocate to each of the different characters on a page, it showed such a great level of analysis and reasoning. I've always loved watching Lara learn. It explains humanity to me when I see knowledge unfold in front of her. I will never cease to enjoy seeing her challenged and this Ready Set School set is a great way of me sharing her new explorations into the world of school with her.